There is to be one Shepherd here. It was first King David (Ezekiel 34:23), then Jesus (John 10:11), and now is the Pope (John 21:17). This role is tied to the role of King. As David was King (2 Samuel 5:12) and Christ is King (Matthew 27:11), so the Pope is (as the Vicar of Christ) “father of princes and kings”. Historically, the Pope has been the unifier of everyone: emperors, artists, the religious, and so on. Whenever emperors would abandon the Faith, they would be publicly corrected. 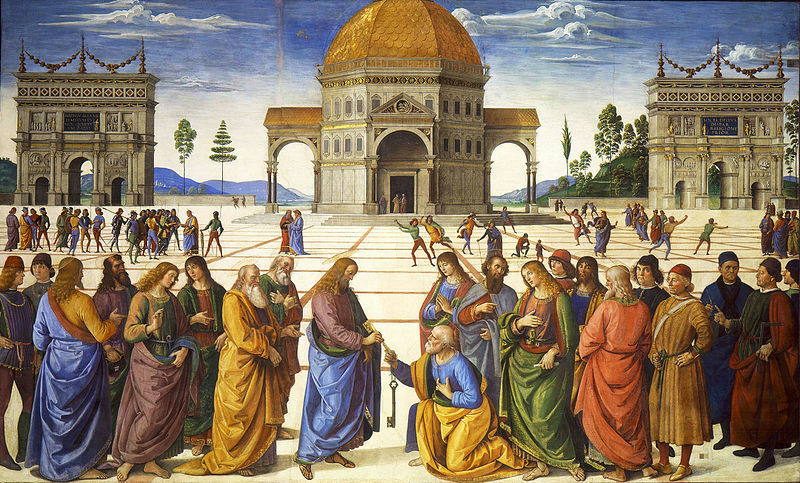 Whenever artists sought to honor Christ, they would be promoted. And whenever Christians in the East would fall into heresy, the Pope would be the one to bring them in line, as Russian Orthodox theologian Vladimir Solovyov noted. The Pope has a temporal role. Only the Pope can thoroughly ensure the recognization of Christ as King in society. On the correction of earthly monarchs, I often think of the Walk to Canossa, the journey of penance taken by Henry IV, of the Holy Roman Empire, in reparation for his grave sins against the Pope. This was done only out of selfishness on Henry’s part, of course, but still, under the right societal conditions, people can be motivated to repent. 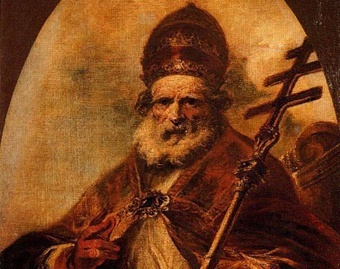 I also think of Emperor Theodosius, who only repented after forceful rebukes by St. Ambrose. Should we not incentivize such righteous actions in our own societies? Of course, we should! Much temporal good has come from our Holy Mother Church, the Mater et Magistra (“mother and teacher”). In the Middle Ages, for example, during which the power of the Church was at its highest, literacy rates increased, art flourished, the university system developed, laws were better-codified, and the Bible became more accessible to lay people. This was all due to popes leading as shepherds and flocks following like sheep. The laypeople of the period, I think, had a greater appreciation for hierarchy and understood that, if left to its own devices, society would collapse. Remember that God had to come down to His people; His people did not go up to Him. Society, today, unfortunately, detests anything other than near-absolute egalitarianism. Now, imagine for a moment, a Papacy unhindered by societal pressures, free to guide its flock to the fullest, and empowered to pave a beautiful kingdom for Christ’s return! Shepherds like Pope Alexander VI understood and promoted this possibility. Unfortunately, because of the rise of democracy and secularism, the temporal honors historically afforded to popes have dwindled. Now, an Alexander would be almost universally despised, and for no reason! The Pope, the Vicar of Christ, the Visible Shepherd, the Father of princes and kings, the pinnacle of civilization — he needs us. Pray for him and forever support him in every way possible. And pray that the Church may be empowered to pave the way for Her King. The Church is my greatest weight. Of course, the weight of over a billion souls would likely be rather large, especially post-McDonald’s, so I suppose that nothing else is really comparable. What does this mean? In an age of moral relativism, instability, and self-gratification, much like the age of the Roman Empire prior to its Christian conversion, I found myself alone and empty after a scarring experience. So, I sought the counsel of philosophy and history – surely, men had answered my questions before! – and I was, after seemingly endless struggles with myself and others, eventually comforted. The Church became vindicated in my heart. The more I study, the more I am forced to accept Catholicism as the true Faith. The depth and size of it, as well as its impacts on culture, force any serious student to step back and pay at least a bit of attention. It took me a while to overcome my initial ambivalence toward any religion in particular – though I was always appreciative of God and enamored with the subject in general – but once I had crossed the proverbial Tiber, there was no going back. I was baptized Catholic, and I vaguely recall some crossing with holy water and lighting prayer candles, but I was hardly raised to practice the Faith. In high school, I dug into a box of things from my infancy. I spotted a rosary within it, along with a note saying that it belonged to my great-grandmother. I mentioned it to a Catholic friend, and he gave me some information about it. That set of events started the arduous process of reconciliation. Later, at the urging of the aforementioned friend, I casually flipped through the writings of the Church Fathers (prominent ancient Christian leaders). I quickly became impressed. I only did this, originally, to assuage my ego. I had made a theological speculation, and he answered me with, “Well, did the early Christians believe that?” I did not know. Anyway, he was right, and I was wrong. My advice for anyone that wishes to be a Protestant is to avoid the Church Fathers like one would avoid a plague. I once remarked to a professor that introducing the former to the latter is like shaking a baby: it might teach them a lesson, but it also might kill them. In my search for the Truth (capital ‘T’ intended), I asked a long series of questions. On the Magisterium (teaching authority) of the Church, I asked: Does God still reveal things to us, or does His message end with the Bible? What would He reveal things through? The idea that God arbitrarily ended His message with the Bible and deliberately chose to allow confusion over doctrine became untenable to me, especially in light of verses like Deuteronomy 31:6 (He will never leave us) and John 17:11 (He requests Christian unity). The Protestant position on this (Sola Scriptura) then made little sense. How could that idea, unprecedented before the Renaissance and ungrounded in Tradition or common sense, be true? I have found no sensible argument in favor of it. Now, who leads it? This is answered by Matthew 16:18, the famous verse, which helped me grasp that Christ built His Church on Peter (aka Cephas), the faithful “rock” (Greek, Aramaic). It’s a parallel to the story of Eliakim (Isaiah 22:20-22), who represented his king. St. Peter, called by Christ to “feed [His] sheep” (John 21:17), likewise represented his King. Some in the historical-critical movement have, naturally, raised objections to St. Peter’s primacy. But even agnostic Protestant historian John Julius Norwich wrote of the pope, “It seems more likely than not that St. Peter did in fact come to Rome and was martyred there, probably somewhere on the Vatican Hill…[and] there can be little doubt that he was the generally acknowledged leader of Christ’s disciples.” Whenever I doubt, I latch on to this information: the historical basis for the Papacy is rock-solid. My goal is to increase the powers and jurisdiction of this great entity to the fullest capacity, because I recognize the impact that She has had and can have on the world. Documents like Humanae Vitae and Evangelium Vitae urge respect for the sanctity of life, Rerum Novarum and Quadragesimo Anno offer economic principles rooted in good morals, and so on. If only humanity would follow the path that the Church has set forth! This temporal aspect, even by itself, is enough to drive me, despite how burdensome this desire can be. Jesus Christ gave “the keys” to St. Peter, the first pope.